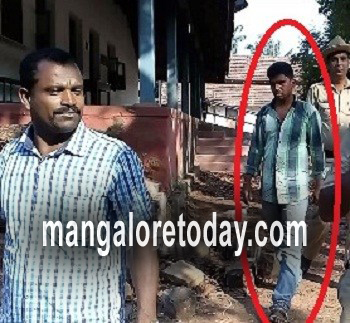 Karkala, May 3, 2016 : An accused in the Nadpalu Bhoja Master murder case of 2008, has been arrested by the Karkala police. The arrest was made at the bus stand at Pavagada near Tumkur and the accused has been identified as Sanjeeva alias Saleem. The Naxalites had targeted Bhoja Master suspecting him to be a Police Informer. The murder took place a day before the 2008 elections. It is learnt that Bhoja Master was undeterred despite Naxals firing in the air outside his house. A daring Bhoja Master even showed the Naxals the machete which was in his house, but was subsequently murdered. Of the ten accused in the case, two namely Manohar and Vasanth were eliminated in a police encounter while another named Shankerappa alias Veeramani was arrested by the Tamil Nadu Police in 2015. He was subsequently entrusted to the custody of Karkala Police. It is learnt that Sanjeeva who has now been arrested by the police was wanted in as many as 20 cases in Andhra Pradesh and was a police informer after being acquitted in all cases. The accused has been produced before the court and remanded to judicial custody till May 11. Thanks to the police. Done a great job.